Whether you write in beautiful cursive or barely legible chicken scratch, our Perfectly Pretty Pens serve as elegant writing utensils for those who appreciate the handwritten word. Pick your favorite cheerful design - Hoot (with a cute owl and the phrase "What a hoot! "), Happy (the word accented with colorful stripes), or Dots (with an all-over pastel spotted print) - to use for your dearest correspondence and everyday jottings. The metal ballpoint pens produce a smooth black line and accommodate standard refills. 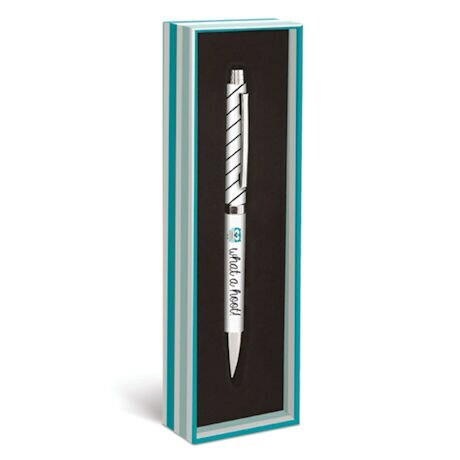 Each decorative pen comes in a matching gift box, perfect for giving to a fellow scribe.